Spring seems a long way away right now as Britain is paralysed, buried deep under layers of snow. We’re feeling a bit left out up here, Cinderellas at the nation’s snow party, because in Caithness we’ve had the heavy grey skies, the sub-zero temperatures, the ice and the gale force winds – everything except the snow. So we lie in bed at night as the house shudders and shakes around us, helpless as astronauts re-entering the Earth’s atmosphere. Even the gravel on the driveway is frozen, as though children had come in the night and glued all the stones together for a joke. But no snow. We’ve had the occasional flurry of those tiny ice spicules, the kind I think of as the devil’s dandruff – propelled into your unprotected face by a 40 mph wind it’s like being stung by a swarm of wasps whose orders included the phrase “terminate with extreme prejudice” – but it’s not the same. You can’t have a snowball fight with ice pellets, it’d be like throwing cold sand. At least it’s appropriate weather to be knitting a gansey. The body is long enough now to serve as a lap-warmer, heavy and warm and inert as a cat resisting arrest, so it’s already being put to good use. As you’ll see from the photographs I’ve now started on the third and final panels on the front, and by mid-February I hope to get the shoulders joined and move on to the collar. Speaking of cats, I saw the world’s most graceless cat in action yesterday. I was out raking the last of last season’s leaves from the back yard when the neighbour’s cat decided to show off and climb our big old tree. The only problem was, it didn’t give itself enough of a run-up, so after a couple of metres of frantic, scrabbling ascent it ran out of momentum and ended up just clinging there, spread-eagled like a cartoon flying squirrel that’s missed its aim. After about a minute of desperate hanging-on its claws gave way and it began a slow, juddering slide to earth, accompanied by a shower of splinters and the raucous jeers of several seagulls who’d stopped to watch. When it reached the ground it slunk off, affecting as much nonchalance as it could under the circumstances, and vowing revenge on the world. I’m still persevering with the anti-migraine pills the doctor prescribed, the ones that rhinoceroses take when they want to chill out. As I hadn’t had a migraine for a couple of weeks I thought I’d try an Indian takeaway, which is one of my known triggers, in a spirit of scientific enquiry – just to see. As it turned out, it was the equivalent of testing a bullet-proof vest with a rocket launcher, and I spent most of the weekend flat on my back speaking in tongues, wondering who’d stolen my legs when I wasn’t looking. Still, at least now I know. Stunning lace work, Margaret, but from the sounds of your oh, so descriptive ‘weatherman’, you should be knitting polar fleece! Hope to see it again after blocking. I love your blog and your metaphors, please keep it up. In other news: My eldest daughter has jusked asked: If our car could travel at the speed of sound, could we still hear the radio? Lynne, in Haruki Murakami’s seriously strange novel “1Q84” there are creatures called the Little People who emerge into our world through the mouths of dead animals, and weave “air chrysalises” which are cocoons made of thin strands they find floating in the air. Is it a digital radio? Can jet fighter pilots still listen to Test Match special? I read a book once that explained why a torch won’t help you see better if you switch one on while you’re travelling on a vehicle that’s already travelling at the speed of light. After which I resolved to stop reading books with equations! Remember kids, jusk say no. Killing my self laughing over that cat. Priceless. I find it interesting that both of you are knitting the same color. They are both lovely. I love the lace, is there a pattern, or is it her own design? Hmmm. Those two knitting projects are both beautiful, but they’re also both the color of cold seafoam. Coincidence? I assume not. What shawl pattern is Margaret knitting? And, um, no more Indian for you, young man! Would you know of any knit clubs or classes around Whitby, North Yorkshire? Hi Joanne, I don’t personally – though I have a couple of suggestions: one would be to post the question on the Ravelry ganseys forum – the people there are pretty on the ball; another would be to try the local branch of the Weavers, Spinners and Dyers association; and thirdly you could ask at the museum at Whitby. Perhaps others have some other suggestions? Good luck anyway! 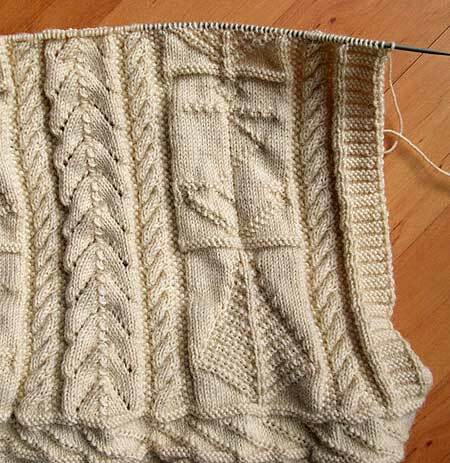 Song & Ruth – it’s my own pattern, cobbled together from patterns in Sharon Miller’s ‘Heirloom Knitting’. 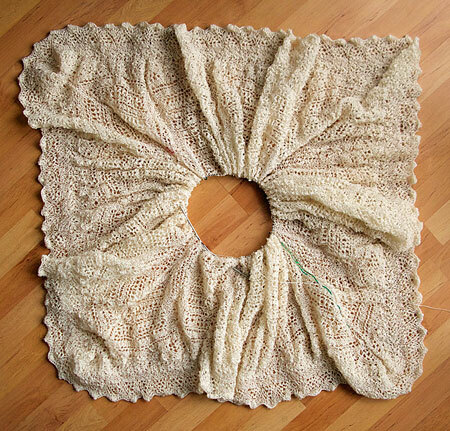 The stitch pattern is however heavily modified to fit the parameters of this particular shawl. Many hours with Excel were involved, as well as knitting up a rather large sample (posted back in October maybe?). Joanne – you may also want to try the Knitting and Crochet Guild (http://www.kcguild.org.uk/index.php?id=4417); there are groups that meet in Skipton and Headingley, and there used to be an East Yorkshire group. Also, Bobbins on Church Street in Whitby (http://www.bobbins.co.uk/) may be worth a visit, they may know of local groups or classes. Finally, try the council website, there is usually a listing of local clubs – the local library may also have this information. “cold sand” – you nailed that description. Oh – again great laughs – “a cat resisting arrest” and the “flying squirrel” cat. Just beautiful! Oh dear about the Indian. You could try making your own curries, testing ingredients as you go. It’s not that hard. My brother and sister-in-law were Yorkshire teachers and they always cooked curry at home – they taught me. You’re probably lucky too – you can simply hit the corner shops for the goods. Whoa – the knitting all ’round is stupendous. 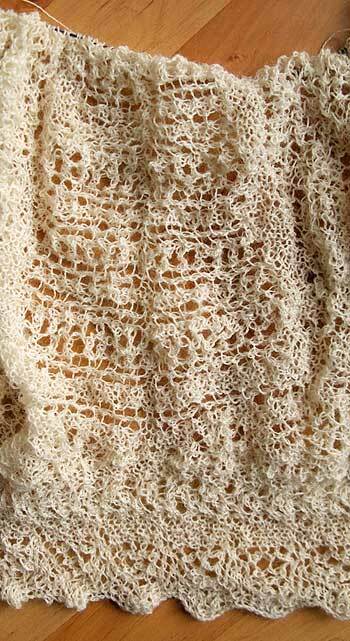 The gansey is enviable and the lace is – yes, SongBird – perfect sea foam! Joanne, you could try your local library. I live in a small town, and our library has a knitting group and a spinning group. You never know. Migraine: I am allergic to MSG could be the curry problem, if you cooked it on your own it might work. MSG is fairly commonly reported as a trigger. If I’m honest, Indian takeaways/restaurant food are pretty much the only food i really enjoy—apart from really good bread and smoking fresh coffee, evil and black as the Devil’s armpit—everything else I eat is OK, but I can take it or leave it. So every month or so, one weekend I just accept I’m going to see visions and dream dreams, and pay a visit to the nearest Indian emporium of currification. No matter how bad the resulting migraine, it’s gotta be worth it! Tell us about the Gansey Nation Store. Is it you, or a separate company or a merger. Just curious. Crack me up – I love the mugs. It’s us doing the design (well Margaret anyway) with Zazzle actually making and delivering the goods. Any further ideas for merchandise gratefully accepted, to keep the blog going! Hello Gordon, nice your meds don’t interfere with the metaphor producing synapses. What if scientists could isolate that neurotransmitter!! In my experience, all cats resist arrest. They too are lovely lap warmers, however. Nice knitting, both of you. I actually went to the hospital to see if I could have it surgically removed, but apparently it’s an alien parasite and its tendrils have infiltrated my brain so such an extent that I’m now in a symbiotic relationship with it. Idea: Knitted Teapot Cozy with some gansey motif . Gordon: coffee, I am missing good coffee. When I brew coffee for my father in law he calls it diesel. Love a strong brew. We just moved to the lovely North Yorkshire Coast miss a good strong coffee. Showed my mum your site and all the wonderful jumpers. She stood in awe – “Oh my! What detail!” is what she said even amid the incontinent spiders. Hi Judit, knitted tea cosies are always in fashion! Also, at this time of year, hot water bottle covers spring to mind (actually, in Caithness, all the year round…). 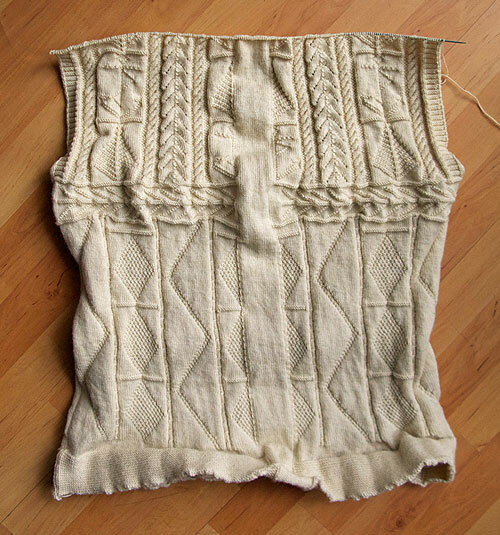 Congratulations on the gansey, Sarah, I hope you’ll share some pictures with us when it’s done. We’re feeling rather cheated, as the rest of the UK has been engulfed in snow for the last couple of weeks, and we havnae! Lisa, best wishes to you and your mum. It sounds biblical, like Ruth amid the alien corn, now i have an image of your mother amid the incontinent spiders! *snort! chuckle! * Given that my mother lives in a log house, spiders hanging from the rafters are a distinct possibility!